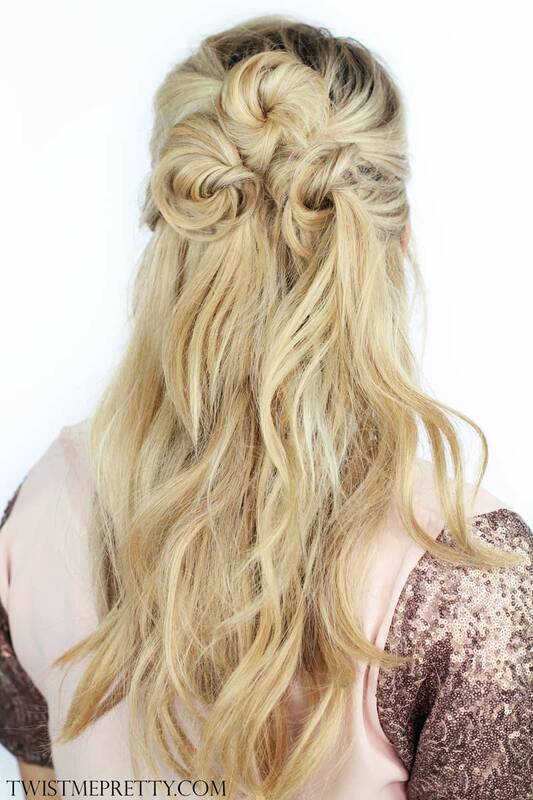 It’s almost Valentine’s day, and we’re thinking about hairstyles to try on the day! Whether you’re out or in with a loved one, on a first date, or just hanging out with friends, it’s fun to dress up your hair in a special style. This post will cover some of our favourite tutorials from around the web, for medium to long hair. Elegant updos, soft curls and elaborate braids are all great choices if you want to achieve a feminine ‘wow’ style this Valentine’s Day. This first style, from Twist Me Pretty, is inspired by roses! It’s a great option if you want a half-up, half-down style. We love the cute buns, and you could curl the rest of your hair, have soft waves, or have it poker-straight, depending on what you like. It’s unique, pretty, and will work on hair of different lengths, from shoulder length to very very long. The tutorial is supplied in both video and written text formats, so it’s perfect if you prefer one or the other. View the tutorial here. This second style, a waterfall braid, is beautifully glamourous. You’re sure to turn heads with these plaits! It’s also simpler than it looks. Again, you could put your own spin on this by curling the rest of your hair, or straightening it. It’s a perfect style if you have naturally curly hair- quick, yet very impressive! View the tutorial here. We love this versatile, 60’s hairstyle! It will impress on Valentine’s day, and is also great for dates & other special occasions. Mix it up with curls to achieve a romantic look, or wear your hair poker-straight to stand out from the crowd. A great hairspray is definitely a necessity for this one! View the tutorial here. This updo is classic, traditional and beautiful. The hairstyle is simpler and quicker than it looks, and uses a hair tie, bobby pins and hairspray/smoothing spray. It’s very sleek and elegant, and perfect for a date night out to a fancy restaurant! If you have naturally frizzy or coarse hair, this style will also work- you could use taming products, or style your hair as-is, for a different look. Straighten your hair before attempting if you have very curly hair, and the result will be smoother and sleeker. View the text tutorial here. All of these hairstyles can be customised to fit your own style. Straighten or curl your hair beforehand to achieve a different look, or add plaits to any of the hairstyles to add your own twist. We’d love to see what you come up with, so if you try any of these hairstyles, feel free to reach out to us on Facebook or Twitter!